Okay, here is my one little result from a day of sketching. I had a great plan of going to all the great historical places in RI and sketch a bunch of them but I got up too late and went too quickly thinking the snow was going to come. Little did I know It was not going to hit until tonight. Oh well. Live and learn… next sketch crawl will be better planned. 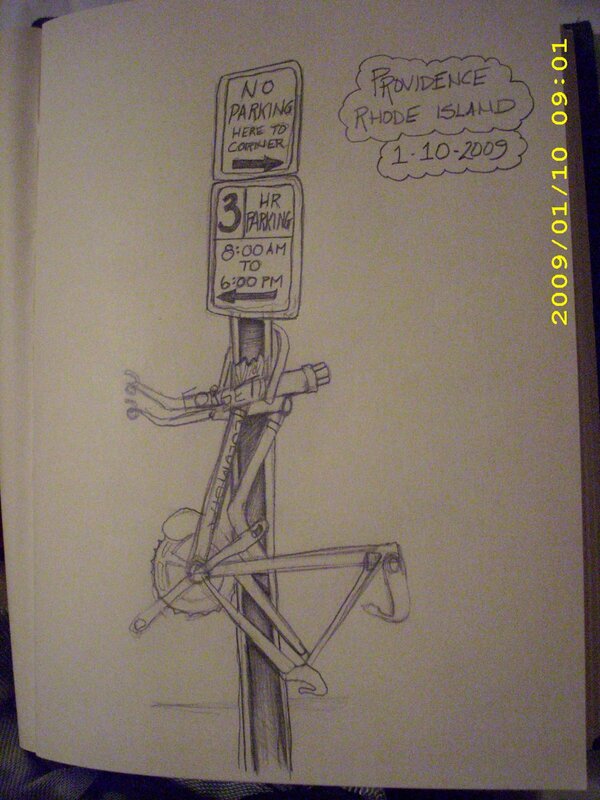 This drawing is of a sign with a bicycle hung on it. I came across it on Benefit Street in Providence when I was looking for Edgar Allen Poe’s old hangout. I never did locate the house where he hung out (should’ve looked it up before I got there) so I figured I would sketch whatever caught my eye… and here it is. I may not have had the successful sketch crawl I imagined but I did keep my 2009 promise – I drew today! Next Post Tonight…. I Sketch! The funny thing is this was right next to RISD!! !